A pickup in the pace of preparations, especially in the tourism and construction sectors, for Expo 2020 Dubai will support UAE’s non-oil growth from 3.3 per cent in 2017 to 3.7 per cent next year and 4 per cent in 2019, said NBK in its latest Economic Update. This should help offset continued weakness in the oil sector and deliver growth of around 3 per cent in the overall economy, it noted. The economy continues to perform better than many of its Gulf peers, with relatively high levels of diversification benefitting its capacity to cope with lower oil prices, alongside continued political stability. NBK sees GDP growth picking up from 2.2 per cent in 2017 to around 2.6 per cent and 3.4 per cent in 2018 and 2019, respectively, well above the regional average. Growth in the oil sector will remain capped in 2018 by the extension in Opec production cuts and possibly stricter compliance with the agreement. The UAE has so far lagged its GCC peers in terms of compliance and has vowed to continue to cut oil output to meet its commitment. Crude output stood at 2.92 million barrels per day (b/d) in October, a compliance level of 67 per cent against a target of 2.87 million b/d under the agreement. Oil sector activity is projected to gradually rise from 2019 onwards. Despite the output cuts, the UAE continues to invest in expanding its oil production capacity in anticipation of higher demand. Adnoc, the state-owned oil firm, recently extended concessions at the Upper Zakum offshore field, its biggest oil field, to expand its output capacity by around 350,000 b/d to 1 million b/d by the year 2024. This is projected to increase the UAE’s overall production capacity from around 3.2 million b/d currently to 3.5 million b/d. Furthermore, in a bid to diversify further from pure crude production, Adnoc has pledged to invest around $110 billion over the next five years in international downstream projects and to develop Abu Dhabi’s unconventional gas infrastructure. It aims to start producing unconventional gas by 2030.Adnoc has also recently sold 10 per cent of its fuel-retailing unit to help finance its expansion projects, raising around $0.9 billion. The Emirates National Oil Company (Enoc) is also eyeing a $1.1 billion expansion of its refinery in Jebel Ali. The expansion is scheduled to be ready by the fourth quarter of 2019 and increase production from 140,000 b/d to 210,000 b/d. A further dip in oil prices could lead to the government pursuing more aggressive fiscal consolidation. Furthermore, interest rates are likely to rise, potentially squeezing liquidity and dampening growth in investment spending. Real GDP in Abu Dhabi fell 0.9 per cent y/y in 2Q17, mainly on the back of a 1.9 per cent y/y drop in oil output. Non-oil GDP was flat during the same period, weighed down by fiscal consolidation efforts. However, with consolidation set to ease and infrastructure projects gathering steam in 2H17, non-oil growth is expected to gradually improve into 2018. GDP growth in Dubai has so far fared better, at 3.2 per cent y/y in 1Q17. Dubai’s important hospitality and construction sectors are performing well. The number of passengers passing through Dubai International Airport came in at a record high of 23 million in 3Q17. Construction activity continues to be supported by preparations for the Expo 2020 event. Over $8 billion has been allocated to Expo-related projects, including for buildings, metro expansions, roads and bridges and Dubai has reportedly already invested up to half of that total amount so far. As of November 2017, the total level of awarded projects in Dubai was up 17 per cent y/y at $302 billion. Over 2018 and 2019 an additional $107 billion worth of projects are expected to be awarded. Following almost two years of falling prices amid tighter regulations, rising housing supply and risk aversion, residential property prices in Dubai appear to have largely stabilized in 2017. According to Asteco, the prices of both apartments and villas were unchanged in Q3, though still down by 4 per cent y/y and 3 per cent y/y, respectively. However, downward pressures on prices are projected to persist in the near-to-medium term due to higher housing supply and further shifts in demand toward the more affordable housing sector. The value of real estate transactions has continued to trend lower in 2017. After trending downwards for most of 2017, consumer price inflation is forecast to rise in 2018. Latest figures showed inflation edging up from 0.8 per cent y/y in August to 1.1 per cent y/y in September as inflation in the food and housing components both gained some traction. NBK sees inflation climbing from 2.5 per cent in 2017 to 4.0 per cent in 2018 on the back of new taxes including the 5 per cent VAT. The VAT, which is due to be levied from 1Q18, is expected to add some 2 per cent to inflation for one year. Given the relatively decent growth outlook, we see inflation moderating only to around 3.0 per cent in 2019, as the initial impact of the VAT wears off. The fiscal balance will gradually improve, but stay in modest deficit at around 2 per cent of GDP in 2018 and 2019. Oil revenues remain relatively weak and the pace of fiscal consolidation is easing, as Dubai’s government gradually increases spending on construction projects in the run-up to Expo 2020. Nonetheless, fiscal adjustment and reform is proceeding, with the establishment of the Federal Tax Authority, subsidy cuts and the introduction of various fees and taxes. Efforts have also been made to rely more heavily on the private sector for implementation of some projects. October saw the introduction of an excise tax levied on tobacco, energy drinks (both 100 per cent) and fizzy drinks (50 per cent). It is expected to raise around $2 billion (0.5 per cent of GDP) in annual fiscal revenue and follows a similar move in Saudi Arabia in June. Furthermore, the UAE will be one of the first GCC nations to implement VAT. At 5 per cent, the tax is expected to generate $5billion in revenues, or 1 per cent of GDP. To avoid relying solely on foreign reserves to finance the country’s public deficit, Abu Dhabi issued $5 billion in sovereign bonds in April 2016, its first issuance since 2009. But there has been no new sovereign debt issued since. The UAE is in the process of finalizing a federal debt law, which will allow the federal government to issue bonds as well. Supported by the relatively stable economic and political environment, yields on Dubai and Abu Dhabi five-year government debt have remained fairly low and steady over the past year, tracking US Treasuries. As of end-November, yields on Abu-Dhabi’s bonds were little changed year-to-date at 2.54 per cent, while yields on Dubai’s debt were down 28 bps at 3.05 per cent. 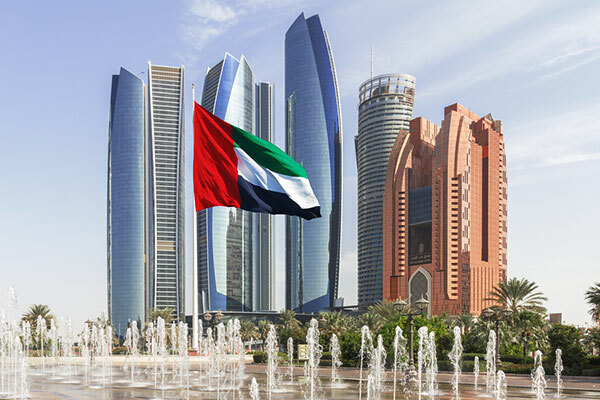 Alongside Kuwait, the Abu Dhabi government enjoys the strongest long-term credit ratings in the GCC. The current account surplus is projected to marginally expand in 2018 and 2019, on the back of more stable oil export receipts and as non-oil export growth gathers pace, thanks to a gradual improvement in external demand. NBK expects the current account surplus to rise from an estimated 3.4 per cent of GDP in 2017 to 3.9 per cent by 2019. Loan growth has fallen to multi-year lows against a backdrop of moderate economic growth, interest rate hikes, higher risk aversion in the climate of lower oil prices and tighter lending rules. In October, lending growth stood at just 0.9 per cent y/y, weighed down by ongoing weakness in private sector credit growth and a continued decline in lending to government-related entities. The central bank’s latest credit sentiment survey (3Q) showed a continued tightening in lending standards, especially for small to medium enterprises, but also points to an improvement in credit growth in the near-to-medium term. In contrast, deposit growth was a solid 6-7 per cent y/y through 2017, as higher oil revenues have helped prop up government deposits. Consequently, broad money (M2) growth has eased slightly, but remains reasonable. Given the recent trends in credit and deposit growth, the loan-to-deposit ratio stood at 99 per cent in October, versus 104.5 per cent a year earlier. After injecting about $9 billion into the banking system earlier this year to ease liquidity constraints, the central bank began withdrawing liquidity from the banking system in July, following improvements in deposit growth. Some $6 billion (around 0.8 per cent of gross bank assets) in excess liquidity was removed from the system between July and September. Interbank rates continued to trend upwards in 2017, following three additional 25 bps hikes in the policy rate following hikes in the US federal fund rate. With the US policy rate scheduled to rise twice in both 2018 and in 2019 and UAE rates expected to follow suit, interbank rates are expected to climb higher still. Major UAE banks have gradually returned to modest levels of profitability in 2017. Indeed during the first nine months, net profits among major banks were up a solid 6.5 per cent y/y, a major improvement compared to the 7.5 per cent y/y decline witnessed a year earlier. The merger of First Gulf Bank and the National Bank of Abu Dhabi earlier in 2017 spurred talks of further mergers in the still-crowded banking industry. According to recent reports, two of the UAE’s smallest banks, the Bank of Sharjah and Invest Bank, are currently in merger talks.